Our mission is to develop the Waterbike sport and strive for our customers to enjoy it as much as we do. 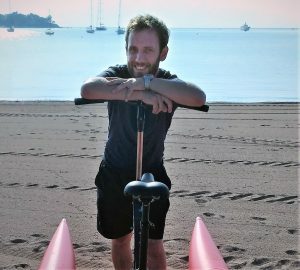 After working and traveling on 4 continents and years spent managing international sales for a motorboat manufacturer, Guillaume one day had a crush for a floating bike. After being in touch with all manufacturers of the world, he decides to leave his job in the motorboat industry and creates Aqui Bikes. Since the, Aqui Bikes’ mission is to initiate French people to Waterbike, do it in right conditions and with the right equipment. Aqui Bikes selects, distributes and rents Waterbikes. Being a booming activity, we rent & sell equipment we have carefully selected and that matches the requirements of the local market. Promotion, demonstration, installation and maintenance: whether you are a private individual or a watersport rental, professional athlete or casual rider, we are helping you in your project so that new sport practice is just simple and natural. As the Waterbike can be perceived as a very simple concept (cycle on water), many models were built over time, more or less advanced. After testing most of those, we do know how the practice can vary from ‘incredible’ to ‘unpleasant’ depending on the equipment used. Because we truly believe in the sport development, we choose the best equipment available on the market and distribute it in the most professional conditions. As a proud Biscarrosse-based company, we rent waterbikes to explore the rich nature of our region and distribute equipment France wide. How fast is that ? Is that stable? Will it capsize? It is super stable, thanks to its catamaran structure. To make it short, it’s stable as a small boat, and much more stable than a kayak or a SUP for example. Yes, simply by cycling backward (like on a fixie bike). Can we ride bare feet? What is the minimal age to practice? That will mostly depend on the child legs length. Typically 8-10 years old children. Does it have any gears? No. Unlike roads, there is no hills on water. The BikeBoat was designed to reach the optimal speed for an average cycling cadence. Can we ride on sea / ocean? Must I stay close to shore? In France waterbikes are considered by authorities as a “beach vessel” – just like paddle boats, rowboats, kayaks or SUPs. Like for those, it is the user’s responsibility to carry the necessary safety gear to get away from the coasts. Do you have any other models? After testing almost all waterbikes available on the world market, we have selected the best manufacturer by taking many criteria into consideration.We keep monitoring the market and will add new model(s) in the future if they match the market expectations. The frame is black anodized aluminium. PVC tubes are red and are available in yellow upon request. Is the recumbent version out? 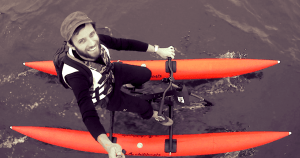 The BikeBoat Rec – horizontal waterbike – is finally available! Please check the ‘Waterbikes’ section or contact us for more info. Aqui Bikes, Waterbike, BikeBoat, Chiliboats... What’s the difference? Waterbike is a generic term that defines a bike that cycles on water. BikeBoat Up is the name of the model that is made by the Brazilian manufacturer Chiliboats. 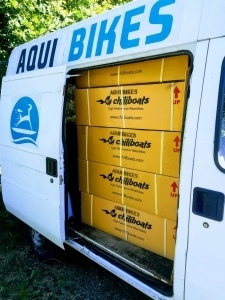 Aqui Bikes is Chiliboats’ exclusive importer. How hard is that to inflate the floats? That’s a similar volume to 2 SUPs, but with a 3x-4x inferior pressure. Can the floats get punctured? It is very unlikely because the floats are abrasion resistant et touch land only when getting on board. However, like any rigid inflatable boat, it may be vulnerable to perforation so caution is always advised. Like any water vessel, it is recommended to rinse after use, especially after navigating on saltwaters. The manufacturer recommends a lubrication process on the gearbox and propulsion system once every 3 months or 50 hours of use. Does it come with a inflator? Yes, the BikeBoat comes with a double action pump which helps assembling the waterbike in less than 5 minutes. If you prefer an electric pump, we can supply one upon request. 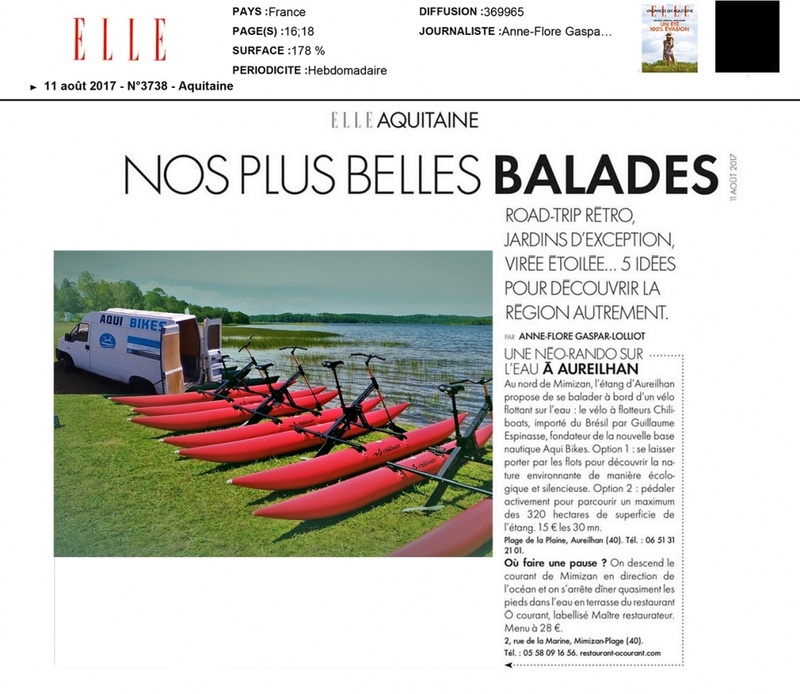 Please check the les waterbikes page, you can also buy it online on our partner website. You may also buy it directly from us by check or transfer wire with no extra fees. The waterbikes have a 6 months warranty in normal conditions of use. 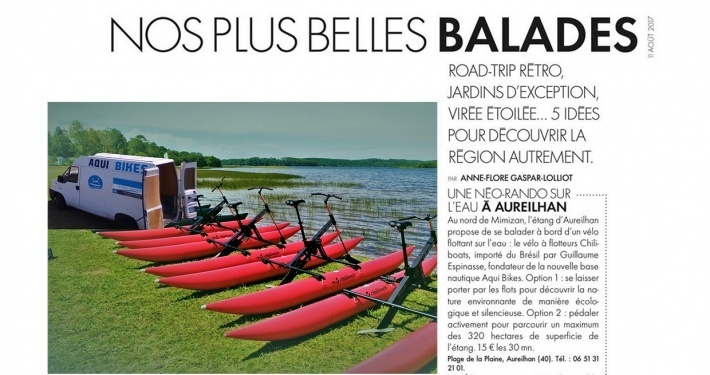 Mars 2018: Aqui Bikes lance le "Waterbike tour Pro 2018"
We always enjoy talking about our passion.